The first Datsun Sports model was the 1959 S211. It used a 988 cc C-series straight-4 producing 37 PS (27 kW; 36 hp). The S211 was based on the Datsun 211 sedan. Incorporated into the side trim were the side badges, which said "Datsun 1000". It was designed by Yuichi Ohta, who had previously designed the Datsun DC-3 and the prototype to the S211, the A80X. Both the A80X and S211 featured fiberglass bodywork, influenced by the Chevrolet Corvette. Only 20 examples of the S211 were built, making the S211 the rarest of all Datsun models. The SPL212 was introduced in 1960. This was the first Datsun sports car imported to the US. The letter L means "left hand drive". Now with steel bodywork, it was built in slightly higher volume than the S211, with 288 produced through 1961. The SPL212 was based on the Datsun 223 truck. It had a 1.2 L (1189 cc) E-series straight-4 engine producing 48 PS (35 kW; 47 hp). A 4-speed manual transmission was specified, and an a-arm suspension with torsion bars was used in front. Drum brakes were used all around. This was the first vehicle to bear the "Fairlady" name. The badge on the trunk lid was the same badge that was used on the Datsun 223 truck. It was named in reference to the Broadway musical My Fair Lady. The SPL212 and later SPL213 were sold only on the export market; they were named for their engine displacement. In 1960, production of the Fairlady was moved from Yokohama to the Nissan Shatai plant in Hiratsuka. The SPL213, produced in 1961 and 1962, is very similar to the SPL212. The main difference is the dual-carburetor "E-1" engine which pumped out 60 PS (44 kW; 59 hp), a large increase in such a small and light car. Like the SPL212, the SPL213 was based on the Datsun 223 truck. 217 examples were built. The first true Datsun sports car was the 1963 SP310 "Fairlady 1500" model (right hand drive), and the SPL310 (left hand drive). In America it was known as the Datsun 1500. The SP310 was based on a modified Bluebird 310 sedan platform instead of the truck platform of earlier models. It featured an 85 hp 1.5 L (1,497 cc) G15 engine (from the Cedric) but with a single SU carburettor. Only 300 SPL310's were equipped with the single carb and these first few had only 77 HP as opposed to the 85 HP of the dual carb models built in 1964 and 1965. A four-speed manual transmission was the only shifting option and has a non-syncro'd first gear. The rear axle used the shafts and differential also from the Cedric. It was a well-equipped car with a transistor radio, tonneau cover, map lights, and a clock. The first SP310s (1963–1964) also had a unique sideways third seat in the rear. To coincide with the 1964 Summer Olympics, Nissan established the gallery on the second and third floors of the San-ai building, located in Ginza, Tokyo. To attract visitors, Nissan started using beautiful female showroom attendants where Nissan held a competition to choose five candidates as the first class of Nissan Miss Fairladys, modeled after "Datsun Demonstrators" from the 1930s who introduced cars. The Fairlady name was used as a link to the popular Broadway play of the era. Miss Fairladys became the marketers of Datsun Fair Lady 1500. Many changes were made for 1965. Though the 1.5 L SP310 continued in production through January, a new 1.6 L R16-powered SP311 and SPL311 joined it. The new model was first shown at the 1964 Tokyo Motor Show, but did not enter production until March 1965. The restyling was executed in part by Count Albrecht Goertz, who would later be involved with designing the first Fairlady Z. Marketed as the Fairlady 1600, or the Datsun Sports 1600 in many export markets including North America, it featured 14 inch wheels and minor exterior changes. The SPL311 was also known in the United States, on the West Coast, as the "Roadster". The front suspension was independent, utilizing coil springs over hydraulic shocks. Rear suspension was a common leaf springs design, dampened with hydraulic shocks. The 1600 SPL311 came with a pair of SU carburators. The engine produced 96 PS (71 kW; 95 hp). The R16 is an in-line four cylinder OHV engine. Early SPL311 came with a high compression engine that had three main bearings, hydraulic lifters, a cast iron block and cast iron head. Timing of the distributor could be easily adjusted to reduce pre-ignition knock and thereby tune for questionable quality gasoline. Engines in later SPL311 had 5 main bearings and this addressed a design weakness. Top speed for the SPL311 with approximately 91 octane gasoline was approximately 105 mph. The axle gearing suffered from design limitations and Datsun performance parts offered a cooling system as a retrofit. Steering utilized a worm gear design. The hood badge said "Datsun" in individual letters, the rear badge said "Datsun 1600", and the side badges said "Fairlady" (Japanese market) or "Datsun 1600" (export market). The SP311 continued in production through April 1970. The first Nissan Silvia coupe shared the SP311's platform. The CSP311 Silvia had an R16 engine developing 96 hp and used a modified Fairlady chassis. The Silvia was the first car fitted with Nissan's new R engine. The R engine was a further development of the 1,488 cc G engine. The introduction of the 1967 SR311 and SRL311 saw a major update. Produced from March 1967 – 1970, the SR311 used a 2.0 L (1,982 cc) U20 engine and offered a five-speed manual transmission, somewhat unexpected for a production car at the time. The first-year cars (known as "half year" cars) are sought as there were fewer than 1,000 produced which are unencumbered with the 1968 model year emissions and safety changes. The in-line, four cylinder U20 engine had a cast iron block and aluminum alloy head. The new SOHC engine produced 135 PS (99 kW; 133 hp). An optional Competition package included dual Mikuni/Solex carburetors; a special "B" model camshaft for 150 PS (110 kW; 148 hp); higher limit gauges; and a license plate surround. In Australia there were no emission restrictions and all 2.0 litre cars were fitted with the Competition package as standard. ^ "1957 Datsun A80X". Datsun.org. Retrieved 2011-11-03. ^ a b c Willson, Quentin (1995). The Ultimate Classic Car Book. DK Publishing, Inc. ISBN 0-7894-0159-2. ^ a b James M. Flammang (1994). Standard Catalog of Imported Cars, 1946-1990. Iola, WI: Krause Publications, Inc. p. 164. ISBN 0-87341-158-7. ^ Yamaguchi, Jack (February 1968). "14th Tokyo Motor Show: & Still Trying Harder". Road & Track. p. 112. Alexander Palevsky (1998). "All the Lust Without the Rust". Sports Car International. 14 (V): 57. "Production Numbers". Datsun.org. Archived from the original on March 15, 2005. Retrieved March 28, 2005. "1967 Datsun 2000 FAQ". Datsun.org. Archived from the original on March 10, 2005. Retrieved March 28, 2005. "www.fairlady.org - Datsun Roadster US racing history". Fairlady.org. Retrieved January 15, 2007. 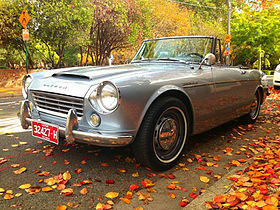 "www.fairlady.org - Datsun Roadster prototypes". Fairlady.org. Retrieved January 15, 2007. This page was last edited on 27 March 2019, at 01:13 (UTC).